Last week, the ProcureWare team gathered for our annual holiday party. It was a chance to get everyone together and celebrate the year’s accomplishments. As a group of us were reminiscing about all the changes we’ve had in 2017, the conversation turned to how proud we are of all the product advancements we’ve made over the past year. I was inspired and thought I would share some highlights. Long before ProcureWare was developed, we envisioned an application that would easily connect to other business systems. In fact, that was a major reason why we created ProcureWare instead of simply giving the old system a makeover. With the new API, developers can pull information from ProcureWare or create information within ProcureWare through a simple interface. The development team is currently working on standard interfaces to other Bentley applications while clients are using the API to create interfaces to their third-party finance systems. I am really happy with the way the approval workflow module turned out. It is simple yet powerful and, because it is so flexible, it allows us to implement all kinds of programs built around approvals. Workflows can be applied to suppliers, bids, and contract records. I am particularly excited about how the workflows are applicable to all types of supplier programs. The original release of ProcureWare supported supplier insurance and diversity certification management. In 2017, we added functions for tracking any kind of supplier certification that could include HIPPA, ISO, Fed RAMP, or any other. Clients can configure the certifications they want to track. As part of the certification tracking, suppliers upload documentation that are then verified by staff. Automatic notifications can be configured to remind staff or suppliers when certificates expire and new documentation is required. Some types of bids have several phases. These might include pre-bid steps, like providing an NDA or prequalification to bid on a project; these might also include different phases of bidding like RFI, RFP, and best-and-final-offer (BAFO). All phases can be connected into a group, making it easy for bid administrators to manage the different steps. Particularly for infrequent types of procurement, like accounting software, buyers need to research possible vendors and invite them to respond to an RFP. With ProcureWare, buyers can send the invitation and create the account in one step. They simply add the email to the invitation list. If the email is already connected to a company, it adds the company to the bidders list. If not, it creates an account and adds the account to the bidders list. When the bidder with the new account receives the invitation, ProcureWare guides them through the registration process. Then the bidder can access documents and submit a bid. ProcureWare has always allowed users to view a personal list of bids and contracts; however, the new personal dashboard gives them a single view of all active bids, contracts, and suppliers waiting for their approval. It is a convenient way for staff to get a quick view of everything they are working on. OK, maybe this is not something most people would classify as a “major” new feature, but it sure is convenient! While the initial release allowed users to export report results into Excel or PDF, the format was basically a list and omitted charts and graphs. The new PDF report includes everything the online report has, including charts and graphs, filter parameters, and report details. It is perfectly formatted and ready to forward to the boss. In a standard (English) reverse auction, bidders see the current low price and can submit bids that are lower than other suppliers. In the Ranked Reverse Auction, the suppliers do not see the current low price; they only see where they rank relative to other suppliers. In the interest of transparency, many public agencies post supplier contract information on their website or supplier portal. Typically, it includes basic information: what was purchased, how much did it cost, when does the contract expire, and who holds the contract. This information is now easily posted to the supplier portal. The contract administrator can flag whether the contract information is visible to everyone or just the company that holds the contract. They can decide on a per-contract basis what, if any, information will be published. This list only represents some of the improvements we made in 2017. 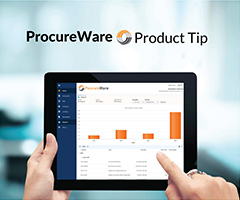 ProcureWare is constantly changing and evolving; major enhancements are released approximately every eight weeks. And because we never charge additional fees for new features or modules, all ProcureWare uses can enjoy any of these new tools. It is our goal to enable ProcureWare users become more efficient, transparent, and consistent while reducing risks and increasing competition. However exciting 2017 has been for us, we are even more excited about the new features coming in 2018… but I’ll leave that for another blog.